Okay, it has been a while. But this time I have a great excuse! Near the end of April, we planned to visit Amherst Island to see the Topsy Farms sheep shearing (my husband had never been) and see friends, so we decided (with a little encouragement, direct and indirect, from some friends and family) to casually check out a few houses that were for sale on the island. Next thing we know, it’s a week later, we’ve talked to a real estate agent in Toronto about finishing up our home (my husband had just ripped a bedroom down to the studs in order to renovate it as he had just finished another bedroom) and listing it on the spring market, and we’ve put a bid in on a home on the island! Then I packed up 90% of our 3 bedroom home in the next 2.5 weeks, put it into a storage locker and took the kids and left town for 4 weeks while our home was fixed up, finished, and sold. Those 4 weeks started out with some stress but we soon fell into holiday mode and really, really enjoyed ourselves. It was May/June and we spent time in some lovely places like Guelph/Elora, Prince Edward County, and Amherst Island, thanks to the generosity of family and friends. We moved back into our Toronto home for just over a month and then moved to our new home on Amherst Island in mid-July! And we’ve been unpacking and settling in ever since, with a few shows in there as well… I did actually pull out of several shows and pulled my application out of a few shows, too, because the move meant I lost a lot of production time, and once we were here, I just wanted to take some time to appreciate it! Shows I went to included Artfest Kingston, where as a bit of a summer-weather-wool-accessories-experiment I shared a booth with my friend and amazing artisan Josée Huard, who started out making recycled wool sweater mittens as gifts one holiday, and built this gift into a great handmade business where she also makes sup cozy cashmere recycled sweater scarves & hot water bottle cosies, as well as amazing recycled wool sweater quilts. That was a few weeks before the big move. After moving, my next show was in Owen Sound, where I enjoyed my first Summerfolk! Replenishing stock this morning at @summerfolk ! And a few weeks after that it was Cabbagetown Art & Crafts Sale, where I had some lovely times with friends enjoyed a few TIFF films after the 3 day show! Last week was the Etsy: Made in Canada – Kingston & region sale at Grant Hall at my old alma mater, Queen’s University, which was such a treat (hosted by Fat Goose Craft Collective)! A shot from yesterday at Grant Hall… I'm not sure I've done a show in a nicer space. Thanks to everyone who came out to support #handmade and meet your local #Etsy sellers at the #etsymadeincanada #kingston event! And there has been lots of work, too! For now, that’s the update. Next post I will let you know what’s coming up in October-December! Long time no write! For some of that, I was actually out of the country on my family’s first ever holiday south (in fact I haven’t been south myself in over 20 years! ), where my husband and I visited a coffee plantation and got ourselves some green beans (we roast our own) from the source! First thing the morning (noon) after the 1:30am arrival from vacation: roast some Mexican #coffee beans! When I got back it was a slow start but now I’m back and in full-on creative mode. However, I’ve been neglecting the blog so I thought I should update you on goings-on. First of all, I’m excited to announce that Lynn’s Lids sheepy wool dryer balls, catnip balls, and tea cosies will be available in another brick and mortar shop, this time in Millbrook, Ontario, at Anchor & Co, which has its grand opening this Sunday from noon to 5pm at 30 King St. E. in Millbrook. It’s also open Tuesdays-Saturdays 10am-5pm, I believe. Doesn’t it look like the sweetest little shop? Finished #bodum cosy for @countycupboardmaps. From one #CanadianMaker to another! I was also faced with a little rejection news this week (sadly I will not be a the Cabbagetown Art & Crafts Sale this September) and had to cheer myself up, so I decided to adorn an orange French press (Bodum) coffee cozy with something that would do just that: Amsterdam canal houses. I will have to update my website to include coffee cosies as well, now, but it will have to wait a bit as we are starting some spring cleaning around here, and on Monday I am heading to a friend’s farm to see sheep shearing with my boys for the first time! I’m pretty excited and hope to get a few good photos and be able to tell you about the process afterwards. I’ve been working on reusable coffee cup sleeves. They’ll keep your coffee warmer than those cardboard things, and you can use them for years! I’m thinking they may make a great teacher gift, or stocking stuffer come that time of year. Reusable #coffee cup sleeve. Save that extra cup or cardboard sleeve every time you buy a coffee. It all adds up! #saveatree #reduce #reuse #teacherGift ? And I’ve been sketching. Lots of sketching. I’m in full production mode for Sunday’s Leslieville Flea and for my new project: Fundraising! In 2011 I was diagnosed with triple negative breast cancer, and later, papillary thyroid cancer. Rethink Breast Cancer was a great support and source of information for me. They are an organization targeted at younger women with breast cancer and their unique issues, as well as building awareness and education in prevention. 50% of the proceeds from all pink products sold in January, February and March will be donated to Rethink Breast Cancer. I have made a few items for this Sunday’s flea at the Fermenting Cellar in the Distillery District, including some pink Sheepy Dryer Ball sets, a tea cosy, and a few hats as well. Come see me on Sunday (I will be in the 2nd aisle to the right when you come into the Fermenting Cellar) or contact me to order your special pink products. I will have them online on the new website next week. expanding my product line to include tea cosies, iPad sleeves, new orb ornaments and a TARDIS or two! having my dryer balls in Style at Home! 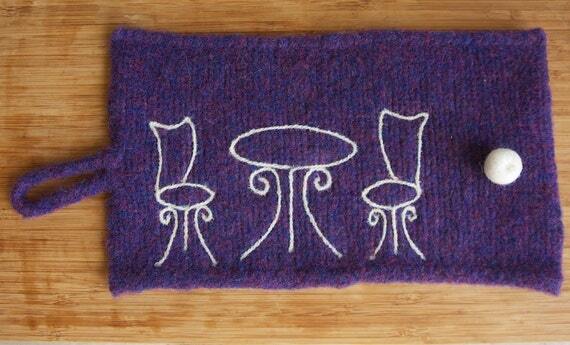 In upcoming news, I have a needle felting class in St. Catharines, which should be fun! This came about from the Niagara HandMade Market, at which I worked away needle felting more ornaments (the family emergency meant I didn’t have as much stock as I needed). A woman and her friend and I got to talking about needle felting and so we planned to get 4-6 of her friends together and have a class in her dining room. The class is 2 hours and they will learn to make an owl, with techniques to make any number of 3-dimensional wool sculptures. The students receive a felting foam and 2 general purpose (38 gauge) needles and the wool to make their owl (see below). A sample for a beginner needle felting class I'm teaching in January. If you'd like to have your own class with 4-6 friends in your home in the GTA, let me know. Includes 2 hour lesson, 2 needles & foam to take home, and wool for making your project in class. $40 each. Min 4- max 7 students. Learn all the basics you need to create your own 3 dimensional wool sculptures will wool and a needle. Fun and quick to learn. If you are in the GTA and interested in hosting your own beginner’s needle felting class, leave a comment or contact me. Also in upcoming news, I’ll be at the Leslieville Flea on Sunday, January 18 from 10am-4pm in the Fermenting Cellar in the historic distillery district. I hope to have every style of hat that I make with me, so if you’ve been thinking about getting yourself a nice warm hat, come down the the Leslieville Flea in 2 weeks! A new style that is really an old style that will be available is below – the rolled brim hat. You can thank my mother, who saw a photo of it and asked me why I don’t make it anymore… Who can say no to their mom? One more thing in upcoming news: I am currently creating an e-commerce site! I get inquiries and emails from my current website, but I’m hoping to get something a little more professional up there that is easy to update (I currently update the site using TextMate and editing the HTML – yes, I was a geek before I was a mom and an artisan). So stay tuned for that… it’s coming very soon! A custom iPad mini sleeve. Love this magenta! Customizing an iPad sleeve on the fly yesterday at the #ArtisanSocial! An #iPad Air sleeve awaiting a button for the #wienerdog lover! Finished custom iPad sleeve for the avid camper! Among the many things I learned this year is this: There are a million different sizes and shapes of tea pots out there. And it’s a good thing I love math, because it’s coming in handy now with the custom circumferences and heights, etc. Anyway, off to bed now. May 2015 bring you good health, humour and happiness. My sincere apologies to the people to whom I spoke at the October Leslieville Flea and assured I would be at the holiday market. Due to a family emergency I am not able to attend. I will be back in January, however, at the historic Distillery District’s Fermenting Cellar. In December, I have 2 back-to-back sales coming up in Leslieville. If you follow the blog then you know about the Artisan Social (check out some of the artisans) on Sunday, December 7 from 1pm-5pm behind the Ceili Cottage (through the red gate) at the Studios of the Gilchrist Canavan School of Irish Dance (1301 Queen St. E.). 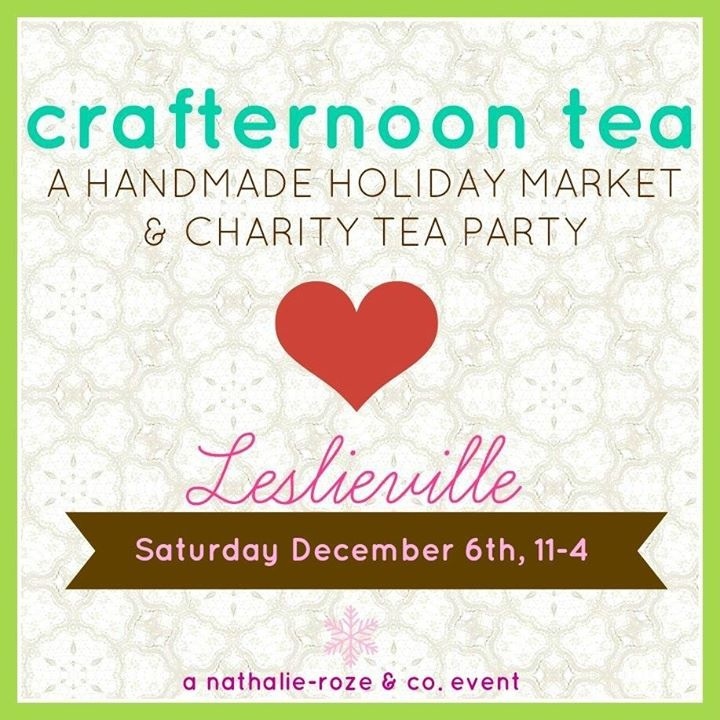 Also, on Saturday, December 6 from 11am-4pm, I’ll be at the 8th annual Crafternoon Tea down the road a bit (947 Queen St. E.) at the Queen Street East Presbyterian Church (SE corner of Queen & Carlaw), benefitting Nellie’s Shelter and Straight to the Streets. This is my first time at Crafternoon Tea and I’m excited to be a part of a great community event! Also in shows, last weekend I was down in Niagara at the Honsberger Estate at my first HandMade Market which was a thoroughly enjoyable 3 day event! I also have one more needle felting class at The Purple Purl coming up in December for beginners (the advanced class was last night). While at the HandMade Market some ladies asked if I could teach down there. I am happy to come to you to teach a beginner class if you can rustle up 5 learners (in Toronto, 4 is fine). You will each go home with a finished needle felted ornament of some sort (depending on the time of year and what we collectively decide), along with a felting foam and a felting needle or two (38 gauge), and the skills to create more on your own. If you’re interested in this fun and quick to learn craft, comment or contact me via my website for more information or email me: lynnslids [at] gmail [dot] com. Etsy shop – last few days of the October sale! Okay, my sincere apologies if I haven’t mentioned this on the blog yet, but if you follow me on other channels (Instagram, Facebook, Twitter) or have bought from me on Etsy or just looked at the shop (it’s in the header!) you know that I have an October sale going on. Only 3 more days to catch this one: 10% off everything with the coupon code LIDSBLOG14! Natural wool catnip balls, Sheepy wool dryer balls, wool ball ornaments (assorted), snowman ornaments, hats, TARDIS tree toppers and tea cosy, Toronto tea cosies, bike tea cosies, Santa ornaments, Toronto iPad sleeves, felted wool hats, Eiffel Tower & London tea cosies, and more! And for now, it’s back to work making and making for the upcoming Handmade Market in Jordan, Ontario November 14-16 11am-4pm daily. Danforth East Arts Fair – this weekend! Okay, so I know the forecast isn’t that great for today, but you can come on out tomorrow to East Lynn Park from 10am-5pm to the Danforth East Arts Fair! If you want to take a look at all of the artisan features I’ve posted of folks who will be there with me, go to category/fellow-artisan/deaf14-fellow-artisan/. I just upped the cuteness factor on these #felted #wool #santa tree toppers with some (local!) mohair locks! Get yours tomorrow/Sat/Sun at #cabbagetown art and crafts sale! I'll have a few #waldorf -inspired hand #knit, #felted #wool tree toppers at #cabbagetown this weekend! Come on out, folks! As well as the popular dryer balls, catnip balls, and ornaments! Hope to see you there!